The Gunnison is one of the longest rivers in Colorado, meeting the Colorado River near Grand Junction after flowing through the western Rocky Mountains for 164 miles. It starts in open, undulating terrain at 8,000 feet elevation, at the junction of two upper tributaries, the East and Taylor rivers, but downstream soon forms a deep canyon, framed by sheer or steeply-sloping walls of jagged igneous rocks up 2,000 feet deep, best viewed in Black Canyon of the Gunnison National Park. 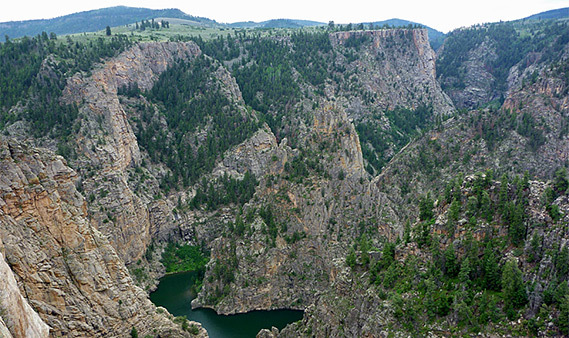 The lower section of the river is less dramatic, winding along a wide, shallow valley, but as well as the national park, the Gunnison runs through the center of a larger though less visited NPS preserve, Curecanti National Recreation Area. This contains a small strip of the hills to the north and south and about 45 miles of the river, which is dammed at three locations to form long, narrow reservoirs. 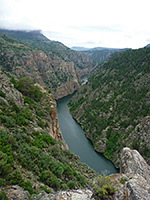 The two reservoirs furthest downstream (Crystal and Morrow Point) lie along the cliff-bound section of the Gunnison River so although the water is deep, the lakes are very thin, resembling the fjords of Scandinavia; dark water beneath precipitous rock walls, mostly lacking any vegetation. The upstream lake, Blue Mesa Reservoir, is less spectacular, being surrounded mostly by rolling, treeless, grassy hills, though it is the site of most recreational activities in the NRA, which include camping, hiking, boating and birdwatching; the main facilities are two visitor centers, several campgrounds, trailheads, roadside overlooks and shoreline access points. The three dams each have a specific purpose; Blue Mesa holds the main water storage, Morrow Point is primarily for power generation and Crystal regulates the downstream flow. 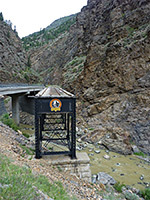 The main road through Curecanti is US 50, which approaches from the southwest, past the turn off for Black Canyon of the Gunnison, and first comes within sight of the river near Blue Mesa Dam. Not far beyond it crosses to the north side of Blue Mesa Reservoir, follows the remainder of the lakeshore and exits the NRA to the town of Gunnison. The only other approach is from the north, along the less travelled Hwy 92 from Hotchkiss, the same route that is used to reach the north rim of Black Canyon. 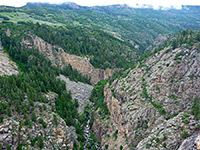 The entry into Curecanti from the north is quite dramatic; after descending gently along the wide upper valley of Crystal Creek, highway 92 reaches the rim of the river canyon, bends to the east and winds in and out of several major, steep sided tributary ravines at the foot of the high, wooded slopes of Black Mesa. The road is generally not much used, and the surroundings have a distinct feeling of remoteness, without any buildings or visible developments. 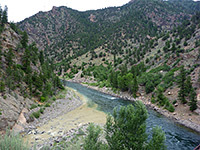 The land is mix of private inholdings and the Gunnison National Forest - the NRA boundary is generally just south of the road - and a few side tracks offer places for free primitive camping. The highway has frequent if fleeting views down to the main gorge and there are three main overlooks; Hermits Rest, Pioneer Point and Blue Mesa Dam, this latter after the highway has descended close to river level, at the east end of the enclosed section of the river. Pioneer Point is the best viewpoint since a relatively long stretch of the Gunnison is visible, as is the flooded lower end of Curecanti Creek, reachable by a 1.8 mile trail. The point has two fenced overlooks about a quarter of a mile apart. Directly opposite on the south side of the reservoir rises the tall slender formation of Curecanti Needle, a detached section of the canyon walls. The gorge hereabouts is very similar to Black Canyon in the national park, just not quite as sheer or as deep. 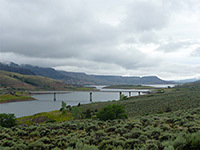 Highway 92 ends by crossing the Gunnison River just below Blue Mesa Dam, past the Lake Fork area (a visitor center and boat launch) to a junction with the much busier US 50. When approaching from the west, US 50 first enters part of Curecanti NRA at the tiny settlement of Cimarron, location of a seasonal visitor center, a campground and several preserved railway engines, this being along the route of a single track railroad that once ran along the Gunnison River canyon, entering at this point via a tributary gorge formed by the Cimarron River. A one mile paved road follows this short rocky canyon to the base of Morrow Point Dam, ending at a picnic area and a large parking lot. The Mesa Creek Trail starts here, following the north bank of the Gunnison River for half a mile. The road also passes a short section of preserved rail trestle across the drainage, now looking somewhat artificial. A steam engine and wagon are usually stationed on the tracks though they have been removed for repairs since 2010. Continuing east, the highway takes a big diversion away from the river to avoid Fitzpatrick Mesa, climbing to a pass at 8,704 feet then crossing a second plateau, before descending to near water level beside Blue Mesa Dam, where highway 92 joins from the north. 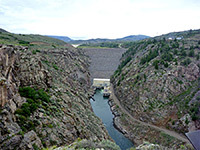 The terrain is much less steep than downstream so the reservoir formed by the dam is much wider (and contains the largest body of water in Colorado), the scenery less dramatic. The hills to the south are low and grass-covered, while those to the north are somewhat higher but still rather dull in color, enlivened at one point by a line of tall volcanic spires, the Dillon Pinnacles, explored by a 2 mile trail. The road passes several viewpoints along the south side of the lake, crosses to the north via Middle Bridge and continues for another 15 miles along the north shore, then moves out of the NRA and shortly after reaches Gunnison. Along this section are five campgrounds, seven picnic areas, two trailheads and the main visitor center at Elk Creek. A seasonal lakeview restaurant is located nearby.